The Vilistus Mind Mirror 6 software offers sophisticated features, innovative user controls, and advanced data analysis. The at-home self-training program helps new and seasoned meditators attain the four ideal brainwave patterns historically found in highly developed and spiritually conscious people. Self-trainers simply hook up (watch a 3-minute video), select the pattern to be trained, press record, and relax while the brain adjusts itself to win the provided musical rewards. These helpful cues enable the self-optimizing brain to access and condition the brainwave pattern being trained. With the help of written manuals and online videos, anyone can use the software's advanced data analysis tools to improve health and enliven the mind. "feeds back" a composite brainwave pattern, like a moving picture, showing your changing states of consciousness, which you can read like a visual language, adjust, and optimize. comes with comprehensive user manuals, instructional videos, almost 24/7 customer support (we have to sleep), free lifetime software updates, a two-year warranty on all hardware, and access to IAM's monthly webinars and periodic newsletter. Classic and extended views. 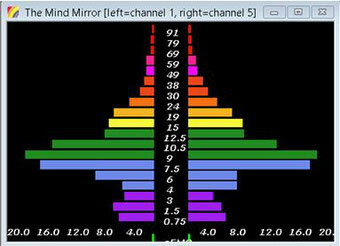 The classic Mind Mirror pattern (above left) consists of 14 frequency bars inclusive of 0.5-44 hertz, or cycles per second. This range can be extended with a keystroke command to either 64Hz or to 100Hz (above right). The display can be changed to any color or combination of colors or appear in an outline with or without the frequency bars. The white numbers below the brainwave display show the amplitude, or power, of the frequencies. This attenuation setting is easily adjusted with a keystroke command or can auto-attenuate. The green surface electromyography (sEMG) bar below the microvoltage settings measures muscle tension in the head, neck, and shoulders to alert the user to frequency-distorting muscle artifact. Various data display windows are shown below. Amplitude windows for all categories. 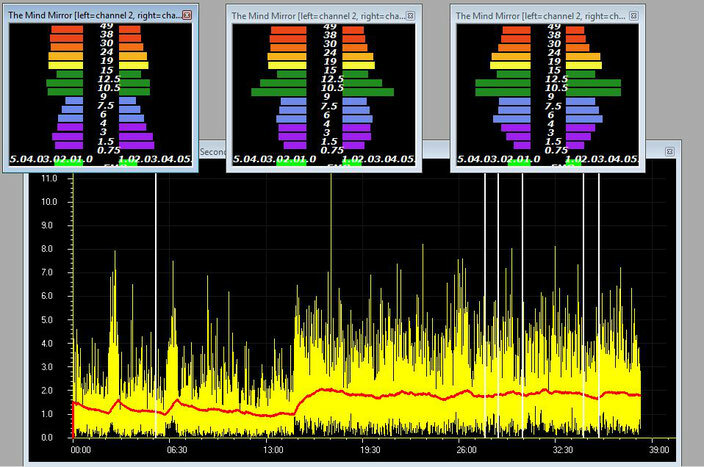 Neurofeedback instrument windows: amplitude, vertical displays, or bar graphs. 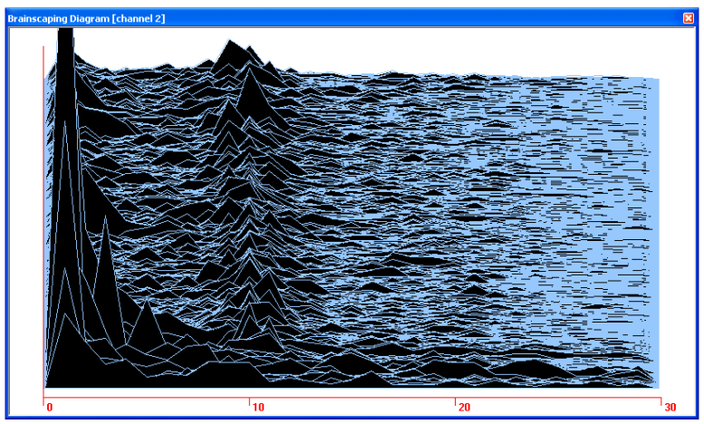 Spectrograms show changes over time. The Galvanic Skin Response (GSR) and Blood Volume Pulse (BVP) sensors respectively monitor sweat gland and heart-rate activity for self-regulation of the body and mind. Using them with EEG provides insights into the body-mind connection for quicker self-regulation of both. Clicking on data peaks or valleys in the GSR and BVP summary windows (above, at right) reveals the timing of events for correlation with Mind Mirror patterns. The Vilistus GSR can be used alone for training physiology due to a table which correlates GSR readings to Mind Mirror patterns and the descent into meditation. The BVP sensor maps pulse rate, heart-rate variability, and stress index. With the add-on Mind Mirror Features Pack, the BVP sensor and the software's Pacer identify the best HRV Resonant Frequency for the heart and breath. Resonant frequency breathing reduces stress, optimizes consciousness, and improves health. The self-training program provides direct audio and visual feedback for the four Meditation, Awakened Mind, Evolved Mind, and Gamma Synchrony patterns and for patterns self-designed with the Pattern Editor in the Features Pack. 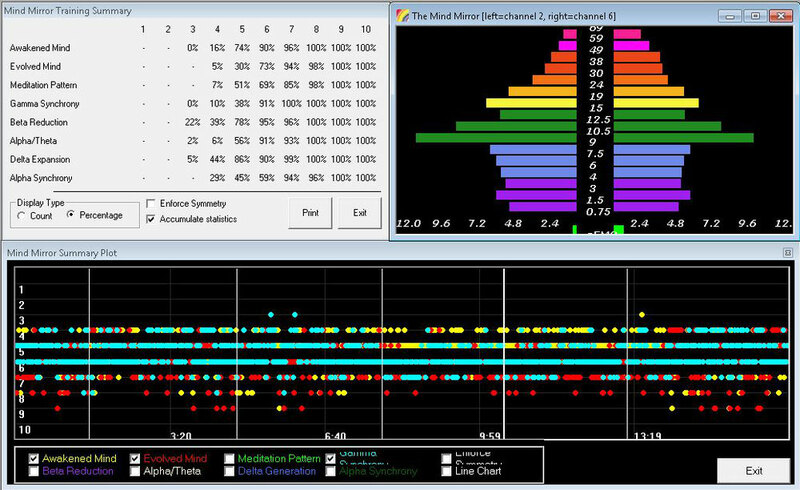 (At right) The colored bars show that the left brain attained the pattern ratios for the Awakened Mind. The greyed-out right brain is out of compliance due to retracted alpha (in green). The Enforce Symmetry setting rewards only dual-hemisphere patterns in ratio compliance. Mind Mirror Summary. Pattern attainment statistics for 10 challenge levels (top left) correlate with the averaged summary brainwave pattern (top right). Clicking on the Summary Plot (bottom) identifies the exact time each pattern was attained. Self-trainers use the percentages or counts in the Training Summary to identify their training level for the next session. 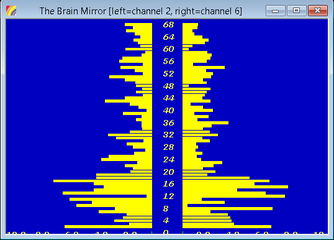 The Segmented Mind Mirror Summary shows averaged brainwave displays for selected segments of time. Segment statistics are also available for the amplitude minimum, maximum, mean, variation, and standard deviation, and for the BVP's heart rate, HRV, and stress index. Pattern Editor. Simply move the lever in the instrument panel to define the shape of your self-designed training pattern. Musical cues sound when the pattern ratios are met. Includes options to augment or inhibit (increase or decrease) the amplitude of the pattern. Auto-augment and auto-inhibit take a two-minute measurement and comfortably bring you up to 70% pattern reward levels. In addition to the individual post-session summary windows for beta, alpha, theta, delta, and low, mid, and upper gamma amplitudes, as well as Dominant Frequency, Signal Quality, and sEMG Artifact, there are Composite Summary windows for each side of the brain. Composite Summaries provide an overview of brainwave activity: the vertical scale displays amplitude; the horizontal, a time record of the session. 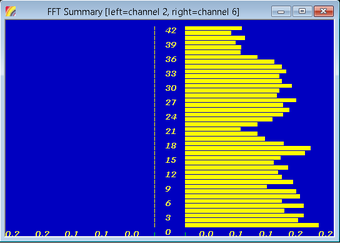 (Above) The user elected to see all bandwidths in this left-brain Composite Summary. The three data lines at bottom are low, mid, and upper gamma. Also shown are alpha, theta, beta, and delta. (Above) The amplitude scale is changed to zoom into the data. Note the 3, 4, and 8-minute simultaneous surges of low gamma (fuchsia) and delta (purple). of brainwave production throughout the session. and keystroke commands increase or decrease the viewing range. 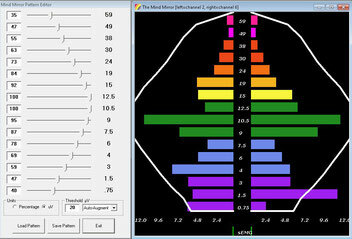 (Above) Person 2 (EEG 2-6) mind-walked with Person 1 (EEG 1-5) during a healing meditation. 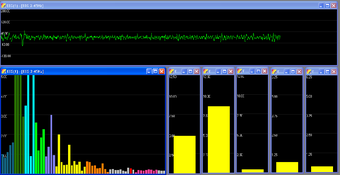 The Correlation Coefficient windows, part of the add-on Features Pack, show their brainwaves connected at 5-10Hz, the frequencies of alpha and low theta, where neuroplasticity occurs. High coherence at 0.7 and above shows brainwave symmetry moving toward synchronization. The Coherence Summary shows a time record at the bottom of the window. 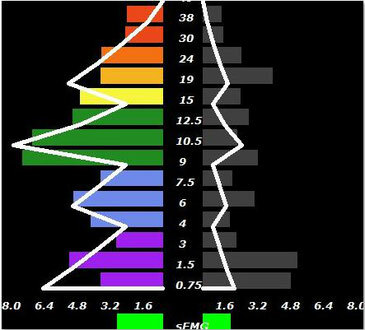 This meditator's Mid Gamma steadily increased as he listened to gamma beat frequencies. 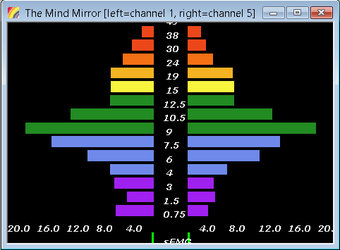 This meditator shows a 20% right-brain preference in this Hemisphere Symmetry window, part of Coherence Reports in the add-on Mind Mirror Features Pack. Asymmetry at or below 20% is of little concern. Measurements above 30% may need attention, if the meditation does not relate to a higher level of consciousness such as psi awareness. The greatest density of yellow dots in the adjustible COSPAR plot (Coherence Spectral Array) shows at a glance the frequencies with the highest coherence -- 60Hz at 95% coherence here. The Mind Mirror 6 software includes many other ways to view and analyze data recorded in real time and in post-session summary windows. These features and tools are intuitive and easy to use. Contact us to ask questions or to order your Mind Mirror 6. The Mind Mirror 6 accommodates group brainwave trainings with a new level of affordability and ease. Previously, only a few Awakened Mind trainers with specialized equipment could hook up more than one person at a time. Today, the four inputs in the Vilistus digital sampling unit accommodate up to four EEG sensors or a mix of EEG and physiology meters. (Below) Four people are monitored simultaneously on one Vilistus encoder. 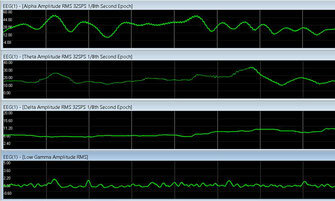 Instrument windows include the Mind Mirror, signal quality (the optimal 1.00), and sEMG artifact. Each of the four Mind Mirror windows can be adjusted in the many ways explained here and on the User Controls page. 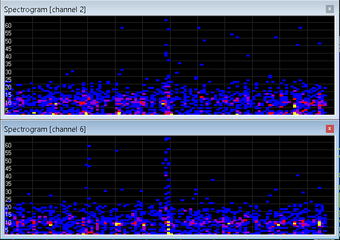 (Above) The red arrows in the left- and right-brain alpha-theta windows indicate whether or not the client's brainwaves are in compliance with the selected ratios. The most commonly used neurofeedback protocols are programmed into the software and can be adjusted easily with the Quick Protocol feature. The Clinical Q, an add-on feature, is a mini-QEEG. Neurofeedback therapists can substitute single-channel EEG sensors for the Mind Mirror's dual-channel EEG leads. Direct audio-visual feedback is available in the free Vilistus Pro software. 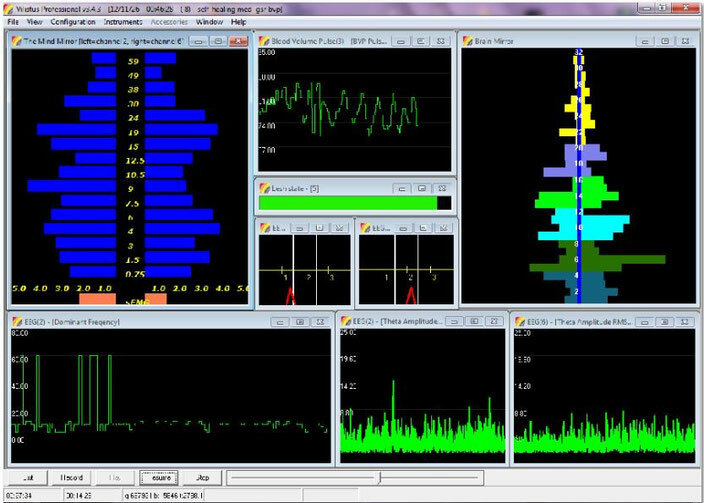 Raw trace, vertical bars, and bar graph data windows are available for 2-45 Hz, Gamma, Beta, Alpha, Theta and Delta Amplitude, SMR, Alpha-Theta (meditation) and Theta-Beta (peak performance). The Mind Mirror 6 is continually evolving. Vilistus software engineer Stephen Clark works closely with co-developer Judith Pennington and IAM's worldwide self-trainers, awakened mind practitioners, and consciousness researchers to develop new features that advance and enhance the software and the experiences of its users. Software updates are provided free of charge. Software support includes comprehensive manuals and online help.